My son L is totally obsessed with Lego. He has been for about six years. My Lego-strewn carpet and reinforced slippers are testament to this fact. 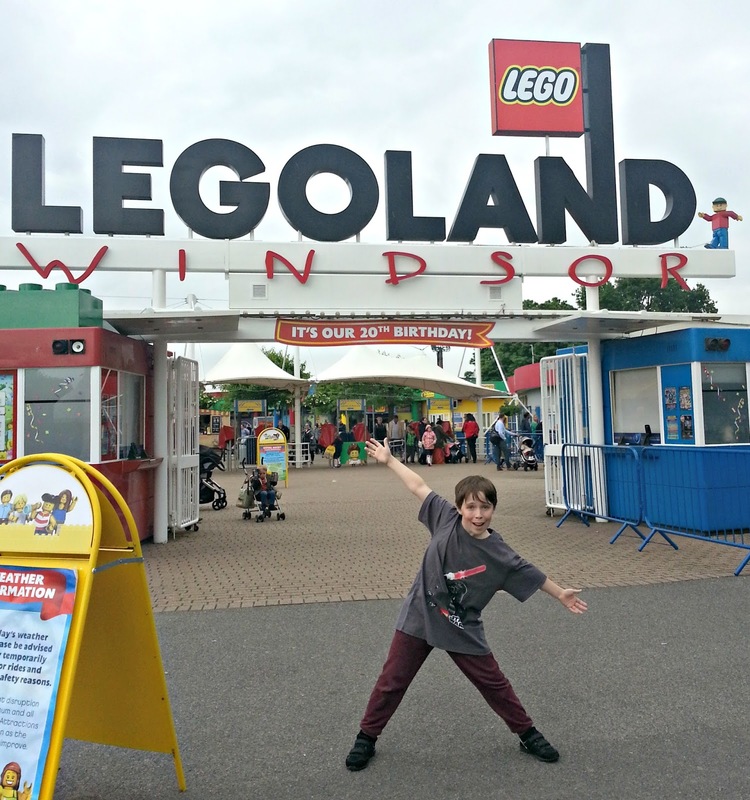 So it is understandable that his Holy Grail of destinations is always going to be LEGOLAND Windsor. Pricewise, it is comparable to other theme parks, but it does work out expensive for a family of four, if you are on a budget. However, we managed to get two tickets from Sun Perks and another two with my Tesco Clubcard. 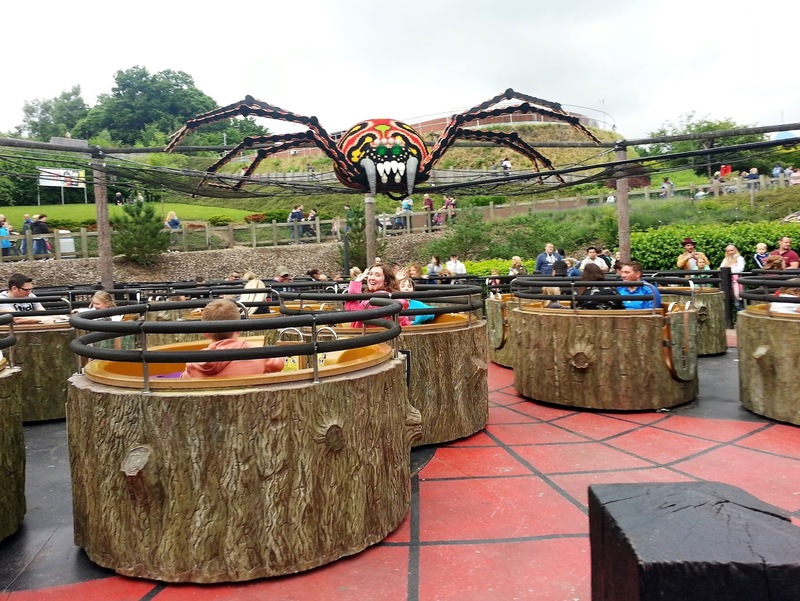 It costs £13.50 in Clubcard vouchers, as opposed to up to £50 for a day ticket on the gate, so definitely worth doing! It was such a fantastic day, for a variety of reasons and I'm going to try to condense the whole experience into one reasonably sized post, which won't be easy! Arrive early. The park doesn't open until 10am, but the gates open at 9.15am and there is an area with shops, toilets and a cafe that you can wander around. We joined the queue at about 9.10am, and there were only two or three people in front of us, but the queue behind us was building up rapidly. Make a list of the rides you are most keen on seeing and do these first, before it gets busy. We actually went to the end of the park and worked our way back, which seemed to work. When you arrive, ask for a map and familiarise yourself with where everything is, while you are queueing. Take your own food, as it is pretty expensive to eat there. We took a shopping trolley on wheels, with everything in, includng bottles of still frozen drinks, which defrosted gradually, keeping everything else cool. It gives you somewhere to put souvenirs and coats too, so nothing gets lost. These tips got our day off to the right start. The park is very large and it is definitely worth planning ahead, to get the most out of it. 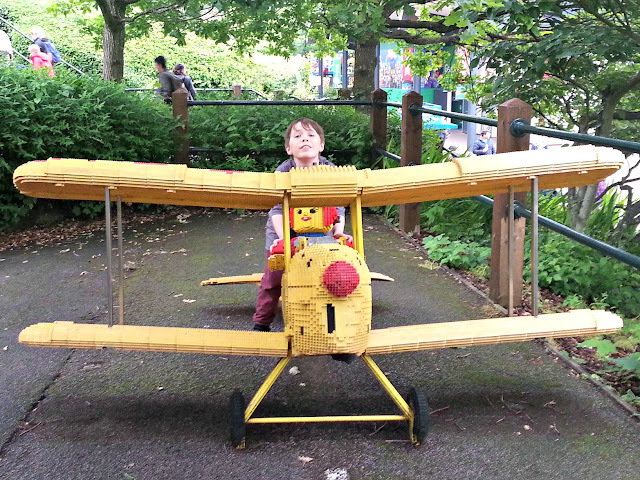 It's a lovely place to walk around and there are lots of different Lego models and exhibits to discover along the way. It is worth noting, however, that as well as being picturesque and entertaining, it is also a lot of walking and very hilly too. There are a number of wheelchairs available and this is another reason to get there early, if you feel you may need one, as they are first come, first served. You will need someone with a lot of upper body strength to push it though! The park is divided into distinct areas and we tackled each one individually, stopping for a rest in between. It's also well worth taking advantage of the Hill Train, which will get you from The Beginning, right to pretty much the middle of everything! The park is very much designed with children in mind and there were several rides that L (who is ten) could probably have gone on by himself, had his sister not been there to accompany him, while I took advantage of some conveniently placed benches! 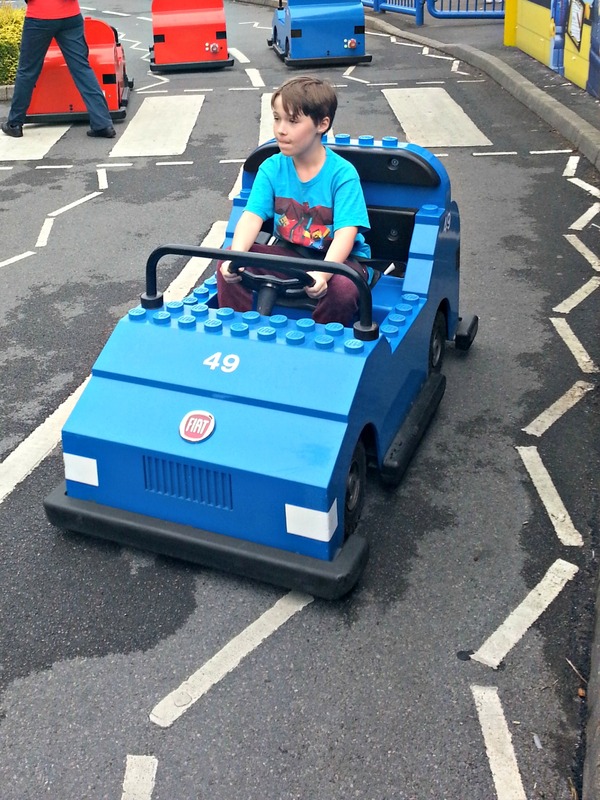 The most recommended rides are generally; The Dragon Coaster, Pirate Falls, Jolly Rocker, Atlantis and Driving School. Out of this list, Atlantis was my favourite. It's an aquarium, but you travel through it in a submarine. Looking through the portholes, you can see all manner of marine life, including sting rays and sharks, swimming about in the water. 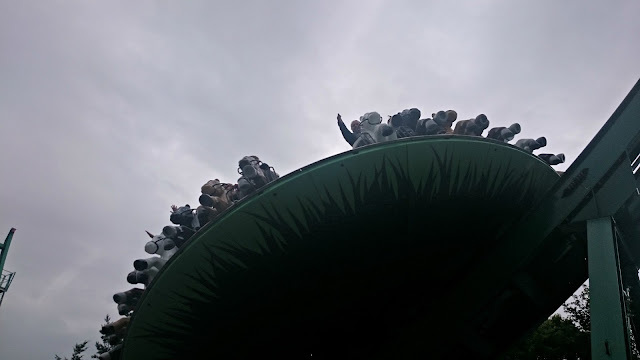 There was one ride, though, which I felt was vastly underrated and I wanted to mention it, as it was a firm favourite of all of us on the day, but there was hardly any queue and I think it might have been because of its location. It's called Mia's Riding Adventure and is situated at the back of Heartlake City, the Lego Friends zone. It consists of individual horses postioned around the edge of a spinning disc, pointing outwards. It's pretty cutesy, with the voice over and the horses, but it's actually quite scary! The ride travels backwards and forwards on a curved track, whilst spinning around. There are moments where you feel like there is nothing beneath you and you are flying through the air, particularly as the track takes you above the height of the trees. It's a similar track to a pirate ship, but there is nothing around you, just a support holding you onto the horse, and of course, there is the spinning too. I would recommend seeking this ride out, if you haven't before. Minimum height is 1.2m. I think we were very lucky on the day, as it wasn't especially busy at all. This could have been because it was Ascot weekend, or possibly because the weather was a bit gloomy, although it didn't rain, but I do think getting there early helped. There was only one queue that was longer than half an hour all day, although I could tell by the length of the queue barriers that they must be considerably longer at times. If you have a disability, it is possible to get a wristband that allows you to join a much shorter queue. This includes people who have difficulty understanding the concept of queueing, or who would get agitated or distress waiting in line for a long time. However, it also includes those people who have a physical disability (but don't use a wheelchair) where they can't stand for a long time, although the website doesn't shout about this aspect. You will need proof of disability and acceptable types of proof are very specific, so make sure you take a look at their website for the correct information, and also photo I.D. There are a lot of disability-friendly aspects to the park and even where they can't control something, like the steep landscape, they have designed it as best as they can, building long slopes alongside the steps. In conclusion, we had the best time there, and loved how everything was aimed at children. There was something to suit every sort of personality, from explorers, to thinkers, to adventurers and most of the rides were entertaining for both children and adults, which made it a real family experience. 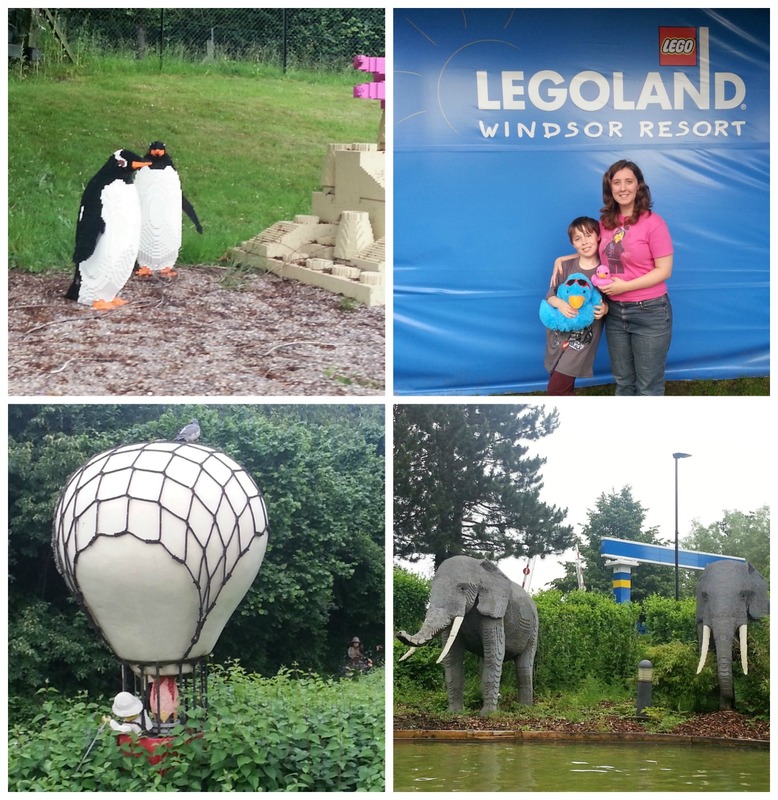 It was a really fantastic day out and I highly recommend it for all the family. This looks a brilliant day out.